Crompton's Battery Reference Book has become the standard reference source for a wide range of professionals and students involved in designing, manufacturing, and specifying products and systems that use batteries. 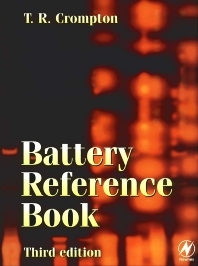 This book is unique in providing extensive data on specific battery types, manufacturers and suppliers, as well as covering the theory - an aspect of the book which makes an updated edition important for every professional's library. The coverage of different types of battery is fully comprehensive, ranging from minute button cells to large installations weighing several hundred tonnes. Essential reference for design engineers in automotive and aerospace applications, telecommunications equipment, household appliances, etc. "Elektor Electronics: 'Until Battery Reference Book became available... I and many of my colleagues had nothing to refer to but the manufacturers' data sheets." "Elektor Electronics: 'Battery Reference Book should prove a godsend for designers of all types of battery-operated equipment, battery manufacturers, and electrical and electronic engineers and technicians who use batteries in their work. It should also prove useful to research organizations."